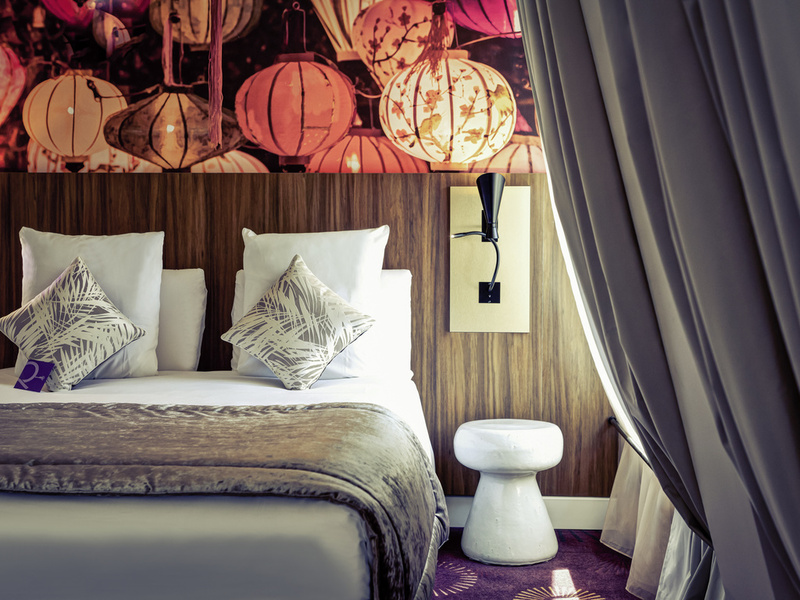 Perfectly located, just a stone's throw from the Old Town with its UNESCO-listed town hall belfry, the Mercure Lyon Centre Plaza République hotel invites you to explore the city. There are so many ways to see the sights: on foot, by bicycle, open-top bus, tramway or metro. Highlights include the Basilica of Notre-Dame de Fourvière, Musée des Confluences, Opera, the Museum of Fine Arts, Théâtre des Célestins and the "traboules," or hidden passageways, of Old Lyons! In the centre of Lyon and close to public transport, Mercure Lyon Plaza is ideally located to get to business meetings or to explore the city centre and its surroundings, including the famous Lyon Museum of Fine Arts. Cité Internationale, Eurexpo and Musée des Confluences are all easy to reach from the hotel. Family Rooms and connecting rooms. Enjoy a moment of relaxation in our comfortable rooms with contemporary decor. Our functional Standard rooms make for a restful stay, while our Privilege Family rooms offer a lounge area with sofa bed. The Carrousel Bar by "M" welcomes groups of family, friends or colleagues in contemporary setting. We also offer a selection of snacks at the bar. I liked the location- very convenient. Price was good too. Bed mattress was saggy with a support pole in the center- uncomfortable. Room was incredibly tiny. I liked being able to open my window. Dear Mrs B., Thank you for letting us know about your experience at Mercure Plaza République. I am sorry to see you didn't enjoy your room. We hope to welcome you back. Best regards, Isabelle, front office agent at the Mercure Lyon Centre Plaza République. I have marked 7 as the room was well used, in need of refurbishment and was very small. However, I would score the staff 10 out of 10. They were absolutely superb. Also I lost my purse a The Beaux Art Gallery, who phoned the Hotel and I believe Alessandra went from the Hotel to pick it up for which I am so grateful. On my return it was waiting for me. Such a relief to me I cannot thank the Hotel enough. Lyon is a wonderful city. Dear Mrs B., Thank you for this very laudatory comment regarding your stay and our hotel. We are pleased we gave you entire satisfaction! . We shared your comments with great pleasure with the team upon the welcoming and the quality service they delivered. They love to make you live wonderful moments and they were very touched by your positive feedback. We hope to welcome you back on a next trip to Lyon. Best regards, Isabelle, front office agent at the Mercure Lyon Centre Plaza République. Dear M U., Thank you for taking the time to tell us about your experience at the Mercure Lyon Centre Plaza République. I am sorry that your experience did not meet your expectations. We hope to have the opportunity to welcome you back. Best regards, Isabelle, front office agent at the Mercure Lyon Centre Plaza République. We stayed two nights in Lyon. The hotel was in a great, central location easy for walking or for public transportation. Service was excellent and friendly. Front desk spoke English fluently. Dear M K., Thank you for your comment and your precious positives remarks, especially the ones regarding the quality of our staff, which is very important for us. We look forward to welcome you back. Isabelle, front office agent at the Mercure Lyon Centre Plaza République. It is regretable that guests cannot open windows to let in fresh air. It was a very,very mild winter and the A/C was not yet turned on. A lack of bathroom venting didnt help either...Thus, after showering, the room became quite stuffy and humid. Aside from that, a very good hotel with a very attentive staff. Dear "Roam21502446864", Thank you for commenting about your stay at the Mercure Lyon Centre Plaza République. Our building, listed to World Heritage, does unfortunately not allow some of our windows to be opened. We are terribly sorry about that. We apologies for the inconvenience cause by the heat. We look forward to welcome you back. Staff very friendly and location excellent. Our room had very little storage and not even pegs to hang coats. Didn't try breakfast as seemed very expensive. Overall a good stay. Dear M L., Thank you for taking the time to share your experience following your stay. I am so pleased it was mostly satisfying. We hope to see you again on your next trip to Lyon. Isabelle, front office agent at the Mercure Lyon Centre Plaza République. The room was a bit noisy but clean. The staff were very nice. The location was right in the center of town which is why I picked it. The bed was comfortable. Dear M B., Thank you for taking the time to tell us about your experience at the Mercure Plaza République. I am sorry that your room dind't meet your expectations. For your confort, we have several room types : Classic (13m²), Privilege (17m²) and Junior Suit (23m²). I am happy to see our central location, next to the main curiosities, satisfied you. We hope to see you back soon. Best regards, Isabelle front office agent at the Mercure Lyon Centre Plaza République. Staff excelent. Room's amenities can be better. Dear Joan A. Audet, First, thank you very much for you stay with us and your review onthe amenities The feedback of our guests is the best way to improve the top-quality service we would like to deliver. Thank you again for sharing your experience, and we hope your next visit will be as pleasant as the previous one. Sincerely, Axel, front desk officer at the l'Hôtel Mercure Lyon Centre Plaza République. Dear M S., Thank you for the nice review ! We'll be pleased to welcome you back soon. Best regards, Isabelle, front office agent at the Mercure Lyon Centre Plaza République. The room was luxurious and the staff super helpful and friendly. The breakfast was delicious. Dear Sharon N., Thank you for this 5 stars review! We receive your compliments with pleasure. Our teams are always working to deliver you a top-notch service. Knowing that you are 100% satisfied is the best reward we can get! We will be so happy if you come visit us again for your next stay in Lyon! Thank you again for sharing your experience, and we hope your next visit will be as pleasant as the previous one. Sincerely, Axel, front desk officer at the Hôtel Mercure Lyon Centre Plaza République. 1 night for business very little room but comfortable - good bathroom but very very little toilet which oblige us to touch the wall facing the toilet that let some traces on the wall. Dear Aureliano G F., First, thank you very much for you stay with us and your review on …. The feedback of our guests is the best way to improve the top-quality service we would like to deliver. Thank you again for sharing your experience, and we hope your next visit will be as pleasant as the previous one. Sincerely, Axel, receptionniste at the Hôtel Mercure Lyon Centre Plaza République. Dear M D., Thank you for this nice review ! We are pleased to see you satisfied. We look forward to welcome you back. Best regards, Isabelle, front office agent at the Mercure Lyon Centre Plaza République. Location is everything. We had a suite but the sofa for the kids was so terrible that we 4 ended up in the main bed..
Dear Mrs T., Thank you for commenting about your stay at the Mercure Plaza République. I am sorry to read the room didn't meet your expectations. We hope to have the opportunity to welcome you back. Best regards, Isabelle, front office agent at the Mercure Lyon Centre Plaza République. Little room and heating problems It was impossible to open windows, to get fresh air. Dear M D., Thank you for taking the time to tell us about your experience at the Mercure Lyon Centre Plaza République. I am sorry that your experience did not meet your expectations. Our building, listed to World Heritage, does unfortunately not allow some of our windows to be opened. We are terribly sorry about that. For the heating, I shared your comment with the technical service to fix it. We hope to have the opportunity to welcome you back. Best regards, Isabelle, front office agent at the Mercure Lyon Centre Plaza République. From the time we came to check in to the time we left the customer service was perfect. We were accomodatedin a nice room with all the best amenities and the breakfast was delicious. Everything with the smile of the staff at the reception. The umbrellas from the lobby were a nice touch for when we wanted to use them while snowing. Merci et à bientôt ! Dear John T., We very much appreciate your comments regarding your stay at the Hôtel Mercure Lyon Centre Plaza République. It is always a pleasure to receive positive feedback. I will share your comments with our team. I am sure that this feedback will serve as an encouragement to all of our staff as we strive to continuously improve the quality of our services. Thank you again for sharing your experience, and we hope your next visit will be as pleasant as the previous one. Sincerely, Axel, receptionniste at the Hotel Mercure Lyon Centre Plaza République. service was great, however room was very small and coffee machine did not work properly. Dear Eduard B., Thank you for taking the time to tell us about your experience at the Hôtel Mercure Lyon Centre Plaza République. I am sorry that your experience with the coffee machine did not match your expectations. At Mercure, we strive to provide a superior service experience for every customer; therefore your feedback is very important to us. Please rest assured that we are taking the appropriate measures to address the problem and prevent future occurrence. We appreciate your sharing your concerns, and it is our hope that you will give us the opportunity to better serve you in the near future. Sincerely, Axel, receptionnist at the Hotel Mercure Lyon Centre Plaza République. I've arrived on 31/12/2018 around 10 pm. Staff was friendly and helpful. The location of the Hotel is simply superb, mostly everything is reachable walking distance. The room was clean and well acclimatized, all appliances (TV, air co, hairdryer, tea, ...) were working properly. The room could have been bigger, that's the only suggestion. Dear M V., We very much appreciate your comments regarding your stay at the Mercure Lyon Centre Plaza République. It is always a pleasure to receive positive feedback. I will share your comments with our team. We hope to see you back soon. Isabelle, front office agent at the Mercure Lyon Centre Plaza République. Great location. Very good breakfast. Good service. Helpful reception. Dear Mrs A., Than you very much for the laudatory review ! I am pleased to see you enjoyed your stay in Lyon. Hoep to see you back soon. Isabelle, front office agent at the Mercure Lyon Centre Plaza République. It was only for one night cause we were on a road trip. Attention was excellent, room spacious and comfortable and breakfast was also ok. Location is fav! Dear Mrs B., We very much appreciate your comments regarding your stay at the Mercure Lyon Centre Plaza République. It is always a pleasure to receive positive feedback. I will share your comments with our team. We look forward to welcome you back. Best regards, Isabelle, front office agent at the Mercure Lyon Centre Plaza République.